Where have the weeks gone? Could it truly have been Christmas just the other day? Gone are all of our favorite Christmas cookies and hello to citrus! 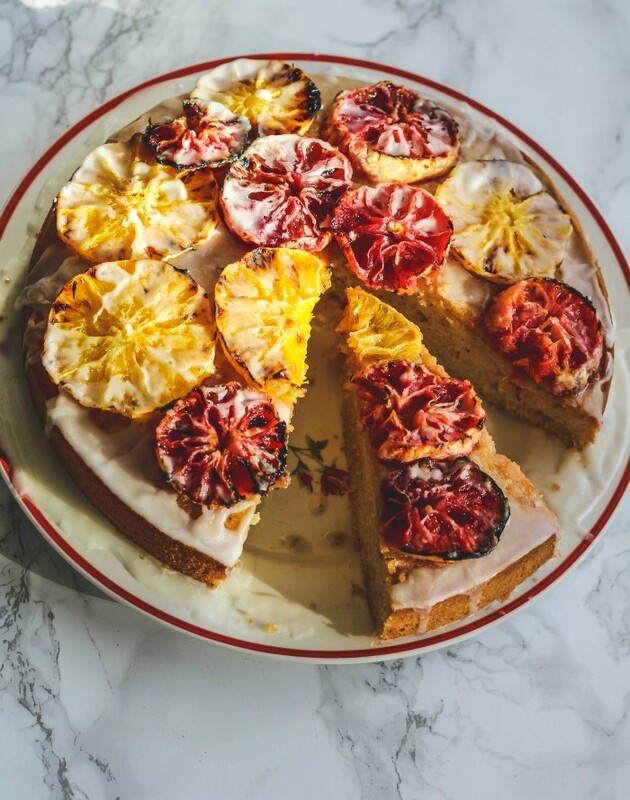 Like this Orange-Glazed Polenta Cake! Not that I’m saying goodbye forever to the Christmas cookies. Will you believe me if I tell you there were still recipes I wanted to make and post here? You can’t say no to fantastic cookies no matter what time of the year it is. But let’s focus on what is happening here and now in my cucina. This cake! And some other things. First…this cake! I have to say it’s been a long two weeks. A family member caught the flu and it’s been weeks of other things related to the flu and I’ve been homebound and cooking and baking. I wish I could say in a house warmed by a fire place. But it’s Florida, people, and it’s been hot here. So to have someone under the weather and be 80F outside is sort of odd. I’m worried about my love and when I worry I tend to bake more. Hence, expect a couple of cakes coming up. And just maybe, some cookies! 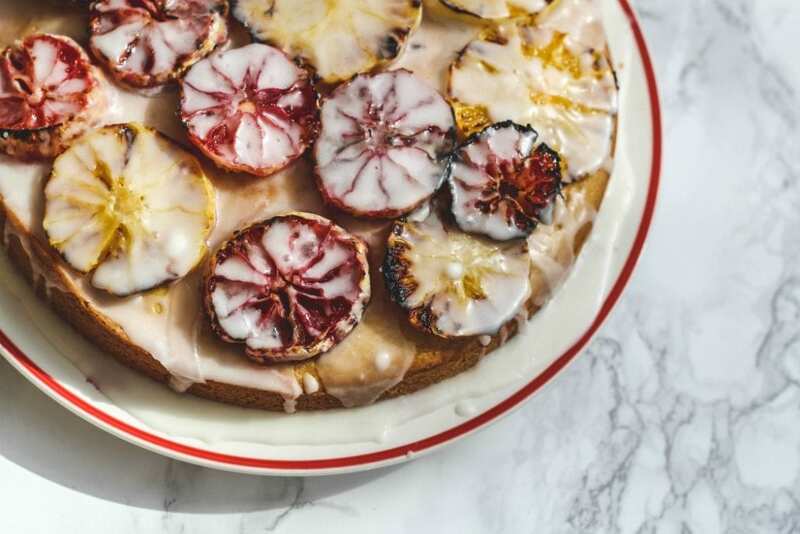 There are two components to this orange-glazed polenta cake. Actually…3. The batter, the broiled oranges, the orange glaze. You may wonder why broiled oranges? Why not? My very hip teen daughter told me this cake is very aesthetic. So there you go…that’s why you broil the oranges. She also told me that it is amazing and she wishes it wasn’t as good because she kept coming back for a small bite. This is after she told me she doesn’t like citrus and cakes. Which is why when I made something very similar was the last time. Italians make various cakes and cookies with polenta. Raise your hand if you’re not sure what polenta is? Polenta is just the Italian version of grits. Polenta and grits are made from different types of corn, but they are basically both coarsely ground cornmeal. If you would like to make this cake totally gluten-free, use your favorite gluten-free flour in place of the all-purpose flour. 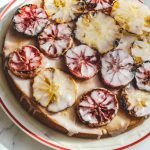 The stunning color of the navel and blood oranges and the orange glazes make this a cake that seems so fancy, yet you didn’t even really break a sweat to make it (unless you live in South Florida!). Be sure to beat the egg whites separately and fold them in at the end. It does make the cake a bit fluffier. I added less cornmeal than when I made this the last time. But you could add 1/2 flour and 1/2 cornmeal if you like more cornmeal. I know there are some recipes that are even all cornmeal. My kids wouldn’t be too thrilled with an all cornmeal cake, so I think the 2/3 cups of cornmeal are the right portion. 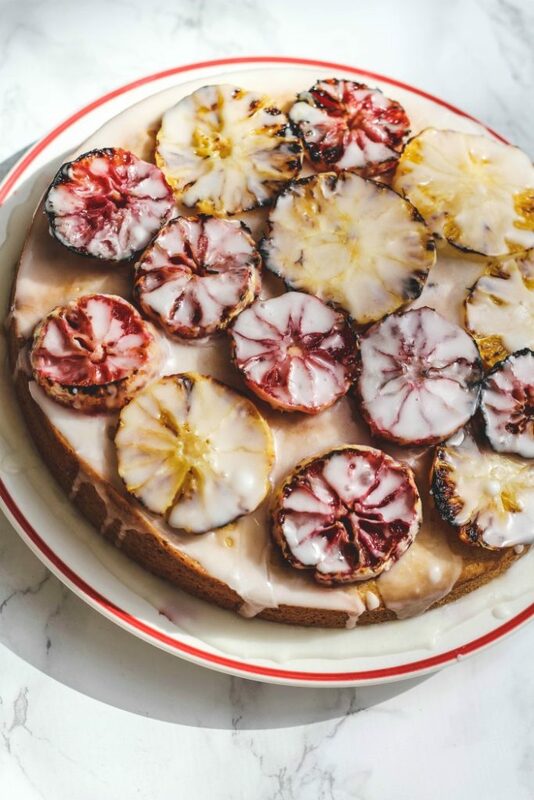 If you don’t want to do the extra step of broiling the oranges, you could place them on top and have them bake along with the cake. 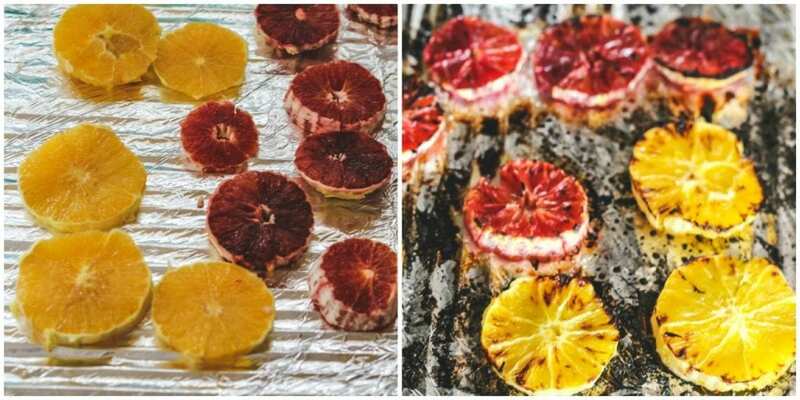 The broiling of the oranges is quite simple. Just take care to really watch them. The sugar on top will caramelize, which make them taste extra delicious. The cake is best eaten the same day. If you have any leftover, the oranges on top will get soggy the next day. You could do what I did and just toss the oranges if you don’t eat them the first day. 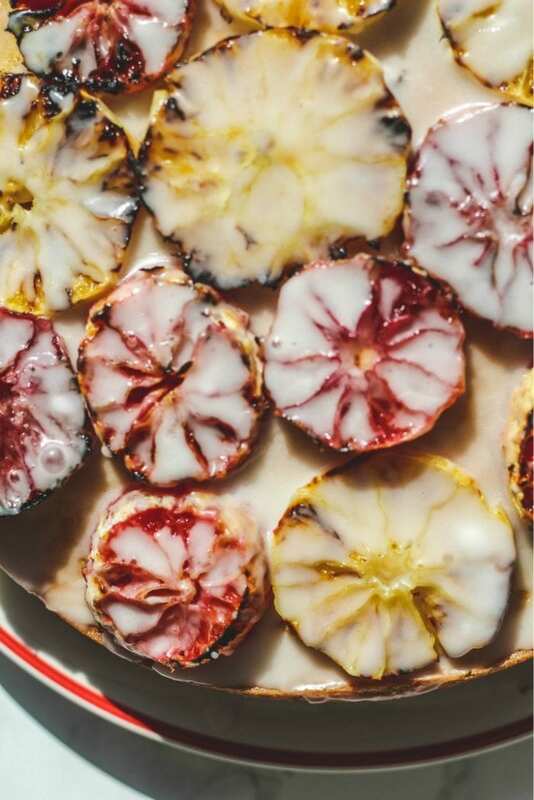 I used a combo of navel and blood oranges. You could use all navel oranges or all blood oranges. This cake is dairy-free, as I used coconut milk. You could use regular milk if you aren’t dairy-free or use almond milk if you happen to have some on hand. You could even use grapefruits. Just make this cake and enjoy a slice with a cup of coffee or tea!! 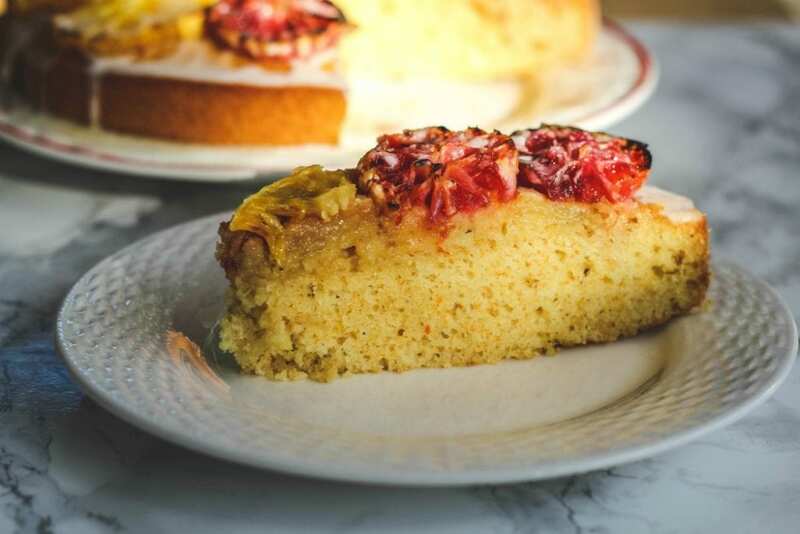 A lovely and simple orange polenta cake that is wonderful alone or served with ice-cream or whipped cream. You can make it with oranges or even grapefruit. The scent of it baking will bring the whole family to the kitchen. Preheat oven to 350 F. Rinse and dry your oranges. Cut the ends off of the oranges and slice the rest of the oranges about 1/8 inch thick. Take out all the seeds. Heat oven broiler. Arrange orange slices in an even layer on an foil-lined baking sheet fitted with a wire rack; sprinkle with 3 Tbsp. sugar. Broil, rotating pan as needed, until slightly caramelized, about 7 minutes; set aside. In a small bowl, add the orange juice and coconut milk. In a medium sized bowl, whisk together the cornmeal, flour, baking powder, baking soda, salt and orange zest. In another medium sized bowl, beat the egg whites until they are soft with fluffy peaks. Set aside the beaten egg whites. In a clean bowl of a mixer, beat the sugar with the oil until combined (about 1 minute). On medium speed, beat in the egg yolks one at a time until combined. Add 1/3 of the flour mixture. Add 1/2 of the orange juice/coconut milk and beat for about a minute. Add another 1/3 of the flour mixture. Stop the mixer and with a spatula, scrape down the sides of your pan to combine all the flour mixture. Add the rest of the orange juice/coconut milk and beat for about a minute. Add the rest of the flour mixture. Stop the mixer and fold in the egg whites gently until combined and you don’t see any more white streaks. Spoon the batter on top the caramelized orange mixture. Even out the top of the batter with a spatula. Bake about 30-35 minutes or until a toothpick inserted in the middle comes out clean. While the cake is baking, prep the orange glaze. In a small bowl combine the confectioner's sugar and add the orange juice. Combine until you have a spreadable mixture. Add more juice if needed to make it thinner or more confectioner's sugar to make it thicker. After the cake has cooled for about 10 minutes, release it from the pan on your serving dish. 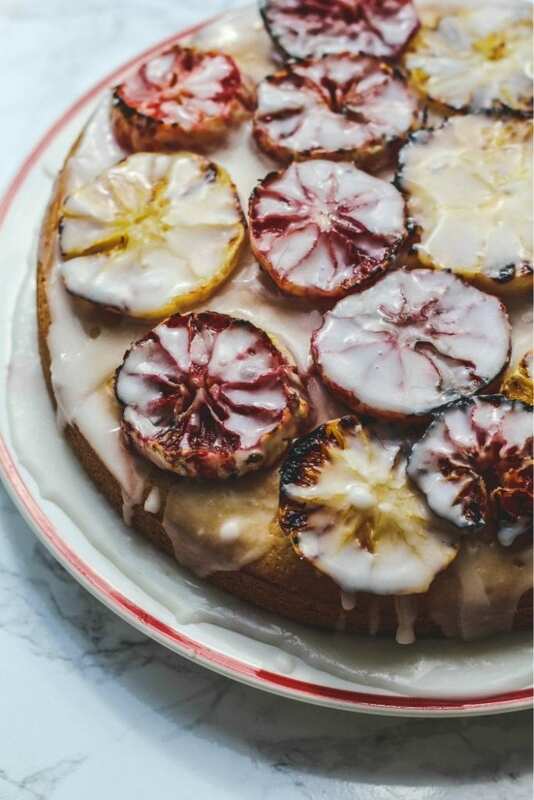 When the cake has completely cooled, place the oranges on top and drizzle on the glaze. Hello gorgeous! Not only does this cake sound amazing, it's absolutely beautiful! That orange glaze has me drooling! I love how creative this recipe is. Wow this cake is so unique! I would love to try it out! This cake couldn't look any more perfect! How pretty is this! I love that glaze on top! Key for sure!